The two most exciting minutes in sports takes place today: The Kentucky Derby. Part of the Triple Crown (the Preakness Stakes & Belmont Stakes form the other angles), it always takes place the 1st Saturday in May & is marked by parties, parades and tradition. The food, drinks and hats worn by ladies of esteem are the most exciting parts of the day's festivities (to me). I've never been to Kentucky (well, I've driven through on my way to Ohio and destinations westward) & there is no reason for me to celebrate or even watch the race, but I'm drawn to the food. In a major way. First, we have Kentucky burgoo. To me, it's just Brunswick stew, something I've been eating since 1985. It's like calling grits "polenta" and charging $4 for it instead of $2. Because it's synonymous with a different part of the South, the name changes. 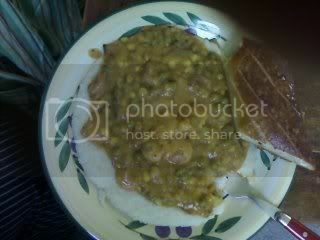 Speaking of grits, my burgoostew is served over creamy grits. Boil chicken or rabbit & beef in both stocks and water with coarsely ground pepper and cayenne pepper until chicken and meat are very tender, about 30 to 45 minutes. Remove bones, skin, dice and shred chicken/rabbit and beef and return to the liquid. Add tomatoes, potatoes, onions, carrots, corn, okra, lima beans, and green pepper. Season with salt, pepper and Worcestershire sauce. Simmer for 2 to 3 hours, stirring occasionally. Add water, if necessary, to keep from sticking. Serve. Next, I made a twist on a classic. Kentucky Fried Chicken Pizza. So, Kentucky Fried Chicken has 11 secret herbs and spices that make it what it is. My pizza has 11 herbs and spices to make it what it is. 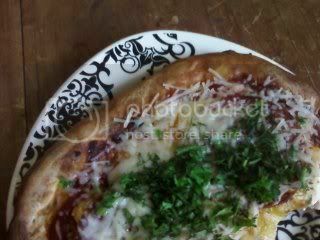 Pizza dough made from Jeff & Zoe's book, tomato sauce, Parmesan cheese, topped with a fresh gremolata, this pizza is pretty darn special. Mix all ingredients together & make a paste. Put on chicken breasts and let marinate for 30 minutes, up to 3 hrs. In a large heavy skillet, pour in vegetable oil until 1/4-inch deep. Heat until a drop of water sizzles when it is flipped into the hot fat. Dredge chicken pieces with flour and place in skillet; take care not to crowd the pieces. Brown until chicken is the color of honey on one side; turn and brown the other side. Allow 20 to 30 minutes to brown chicken on both sides. Use a lemon zester to remove about 2 teaspoon of lemon zest. Combine all the ingredients in a bowl and season to taste with salt and black pepper. You can pound the ingredients together with a mortal and pestle or use a food processor & pulse everything together. Last, but not least, we get to the alcohol! The best reason to have a party. Mint juleps are the official drink of the Kentucky Derby and are the epitome of Southern comfort (pun intended). A julep is any sweet drink made with a mix of liquors, water and sugar. Technically, you can have a strawberry julep (which is more apropos this time of the year...strawberries are EVERYWHERE) . The mint julep is made with fresh mint, bourbon, simple syrup or sugar, and shaved or crushed ice. Traditionally, mint juleps are served in silver or pewter cups, and held only by the bottom and top edges of the cup. That enables frost to form on the outside of the cup. Nowadays, ladies & gents sip them from souvenir cups with Churchill Down logos on them. No, these drinks are not like mojitos. Mojitos are anchored by the mint. Mint juleps are anchored by the bourbon. They're strong & kicky. The mint is just a garnish, really. I'll drink Jim. I'll settle for Jack, but I prefer Southern Comfort (it's like a fake bourbon/whiskey, but who cares? It tastes good). Into a tall glass add mint sprigs, sugar and water. Fill the glass with crushed ice, add bourbon and stir. Decorate with slices of orange, lemon, pineapple and top with a cherry and more mint sprigs. Serve with a straw. Um, KFC Pizza? Now that's exactly what I'm talking about - love it! You need yourself a hot brown to go with that burgoo. And be a dear, have an extra julep for me? The pizza is doing what it needs to do. That's good stuff. I do love a mint julep! That burgoo/stew sounds wonderful. I guess it is one of those things that you can't make in small quantities!